African clothing and attires have come a long way and now is the time to give it its pride of place on the global scene. African attires have emerged from the traditional loose blouse and wrapper, to body fitted or hug style, ball gowns, jumpsuits, peplum tops, bridal gowns, men’s corporate suits, swim suits, pants, leggings, etc are all making bold statements in the African fashion industry. Why Isn’t African Attires Mainstream? Why African clothing? Why should you care? Well, in recent times, the number of online searches for the term ‘African Fashion’ has literally been on an upward growth curve. And if you are like me, you’ll definitely know there is something going on here. For starters, African Fashion is growing. With the level of exposure African clothing gets through social media, YouTube, Wikipedia, etc, lots of people across the globe can now see various unique and creative fashion statements from which to choose. Nowadays, it is becoming very rare to watch a fashion show without seeing at least some African influence. It is becoming popular to see a Dashiki, Ankara, or Kente colored cloth in major fashion shows and parties around Europe. Western fashion now incorporates African-inspired ideas. Celebrities such as Chris Brown and Beyonce have been spotted wearing traditional Dashikis and other African attire. And you and I know that if a celebrity wears it, it becomes a trend! It is now seen as fashionable to wear African-inspired clothing in everyday life. More and more people are being drawn to the niche due to the simple fact that they see others wearing these clothes. Change is constant, but guess what: many people still have this image of a dark-looking man wearing leopard skins and brightly colored feathers when they hear the term: African attire. And I cringe anytime someone says “isn’t African clothing mainly zebra prints?” Hello! Africans don’t wear only that! At least, not anymore. African clothing has changed over time, with the greatest impact on clothing starting in the 20th century because of trade with Western countries, but lazy clichés do little to advance the continent’s creative designers. Europeans and Arabs influenced African clothing, especially in the northern regions. I can still see the influence of the Arabian culture in the designs, embroideries, and long robes worn by some Africans in their everyday lives. However, the rapid changes occurring due to globalization has made modern Africans combine the old with the new (Africans watch MTV too you know 😀). So, tired and worn out clichés like “tribal,” “ethnic,” and “exotic” are outdated terms when describing African-inspired fashion. 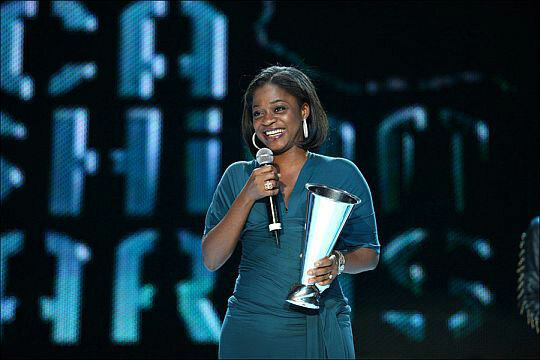 Born in Lagos, Nigeria, Folake Folarin-Coker founded Tiffany Amber, a world-famous iconic label in 1998. Schooled in Europe, she was opportune to interact and engage with various cultures while still at a young age. She is a self taught fashion designer and creative director. Although she has a Master’s Degree in Petroleum Law from Switzerland, her passion for fashion led her into fashion design. Folake has bagged very many accolades which I won’t be mentioning here. I’ll simply say she is recognized globally, making her the first African fashion designer to showcase her talent at the New York Mercedes Fashion Week two years in a row! She also has made it onto the Forbes Power Women in Africa list. (See why I had to start with her?). In addition, she has been widely featured by international media houses such as CNN, and in 2013, she received an Enterprise Award at WIE (Women, Inspiration and Enterprise) Symposium. Lisa Folawiyo studied Law at the University of Nigeria, but opted to pursue her love of fashion. She is a Nigerian fashion designer who is famous for the way she creatively fuses traditional West African fabrics with modern tailoring techniques. Her style is simplistic but innovative, and she also loves to play around with colors and mix prints. In 2005 she launched her label Jewel by Lisa, which has since grown to become a global fashion brand with showrooms in New York and Nigeria. Some of her celebrity fans include Beyonce, Kelis, Tasha Smith, and Eve. Her designs have been showcased in the UK, US, and South Africa. She won the African Fashion Award in 2012, and also was featured in Vogue Italia in 2012. Women’s Wear Daily (WWD) named Folawiyo among the eight emerging talents in 2014. In 2015, BOF500, a prestigious list of international brands, featured her among top fashion brands making an impact on the global scene. Nigerian born Duro Olowu is a London based fashion designer, who shares both Nigerian and Jamaican roots. He is talented in working with patterns and is famous for his unique and colorful African prints. His talent has earned him global fame and recognition with top clients to his name such as Michelle Obama, Linda Evangelista, Solange Knowles, and Uma Thurman. Olowu has numerous awards to his credit. In 2005, he was the first designer to be named New Designer of the Year at London Fashion Week without staging a catwalk show. At the African Fashion Awards in 2009, he was named the Best International Designer and was one of the six nominees for the Swiss Textile Federation’s top prize of 100,000 Euros. Yeah, you guessed right. They are twins, and that’s what Mataano means in Somalia. The Maatano fashion house is owned and run by the twin, Idyl, and Ayaan. The unique thing about their designs is that they are multicultural. Oprah’s interview of them on her show brought them to limelight, and till this day, they continue to wow the international scene with their unique designs. Deola Sagoe is a renowned Nigerian fashion designer and founder of The House of Deola Sagoe. She has a Masters Degree in Finance and Management. She has a global following which includes notable personalities such as Oprah Winfrey and Will Smith. In addition to appearing in international shows and magazines, she is also known to design Naomi Campbell’s clothes. Her recent works include hand-dyed Adire fabric, which is made by Yoruba women. Her reputation spans beyond the African continent, earning her fame and respect. Aside from showcasing her couture collection at Cape Town and New York Fashion Weeks, Deola won the MNET/Anglo Gold African Designs 2000 Award. United Nations World Food Program appointed her Nigeria’s ambassador to the program, “Catwalk the World: Fashion for Food.” This was aimed at raising funds to reduce, by half, the number of starving people in the world, especially children by 2015. Deola is one fashion designer who is surely putting Africa ahead in fashion. Africa is rich with so many talented fashion designers with great ideas; however, there are challenges that hinder their success in the fashion industry. Let me highlight a few. Getting the right connection in the fashion industry is a big hurdle to jump. It therefore becomes difficult for talented fashion designers to find a platform to showcase their work. Without the right connections, your work and your name may rut in obscurity. Ironically, there is a growing interest in African fashion and African fashion designers based in Europe and America; however, designers within Africa are still trying to find a sustainable market locally. Lack of business skills is also a major challenge. There are fewer universities/colleges that offer fashion programs. They do not see the need for it. However, if you know how to design but do not have business skills, it becomes difficult to thrive in the fashion industry. Financial knowledge, marketing, management skills, pricing models; all these are critical to take a good designer and turn them into the owner of a successful business. There are so many ways to rock African attires with the clothing items you already have in your wardrobe. Let’s take a quick look at some of our bold and unique designs. Kaftans, which are also called boubous, are full-length embroidered robes. Originally only worn by West African men, kaftan is now also worn by East African women. It is made from cotton or silk, and it buttons down the front. Style tips: wear your brightly-colored kaftan with the beautiful safari/west Africa patters with a matching head wrap and scarf (or even a straw hat). You can make your waist look tiny by cinching your kaftan in with a wide leather belt. A silk or cotton kaftan top looks wonderful over shorts. Dashiki shirt is worn in Africa as a hippie shirt by men and as a vintage top by women. The shirt looks very fashionable with haute design. It can also be used as a tribal blouse by women. The sleeves are short, slightly above the elbows. The pure cotton unisex shirt can be worn by men, women as well as kids. You love skirts? Try pairing a flared, mini, skater, midi or maxi skirt in an African print with a solid tee or button-down shirt and… wooala! You’ve got yourself a perfect brunch, lunch or date outfit. And if skirts aren’t your thing, you can easily pair African-print pants and shorts in cuts that flatter your womanly shape with tops for casual wear. The blend is simply unique. You can shut the place down and wow everyone with a one-piece African print jumpsuit or romper (so chic! ), or stick to two coordinating pieces for an exotic pant, skirt or short suit. African tops come in varieties; crop tops, peplum tops, boxy cuts and even blazers! Try wearing one with a black pencil skirt or your cutest pair of jeans for a quick and easy-to-do evening outfit. Not a bad idea, not bad at all! The fashion options with African dresses are endless – as long as you can find a good tailor, you can sew a dress with African fabric in every style imaginable. Your imagination is the only barrier, don’t limit yourself! Most dresses work for almost all shapes, but the details (frills, patterns, embroidery, etc) is what makes these African dresses stand out from the crowd. If you’re not the runway model type that’s ready to strut your stuff with African dresses or African print from head-to-toe, you can incorporate the African style into your accessories, with hats, bags, shoes, head wraps and chic jewelry fit for a Queen. I mean, walking down the street flaunting an African print necklace or handbag is cool, don’t you think? Let’s be honest, prints are never going to go out of style any time soon, and a great way to incorporate them into your wardrobe is to use African prints! Express your fashion statement with a blend of bold African attires and unique fashionable accessories. Have your say about what you have just read! Leave me a comment or a question in the box below.